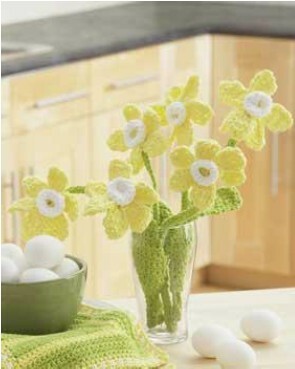 Crochet a lasting bouquet of cheerful daffodils with this flower crochet pattern. Display in a glass vase anywhere you want a bit of color. Floral wire helps keep the flowers sturdy enough to arrange. Size: Daffodil: Approx 2½ ins [6 cm] wide. Gauge: 15 sc and 16 rows = 4 ins [10 cm]. Instructions: Daffodil (make 6). With A, ch 3. 1st rnd: (RS). 6 hdc in 3rd ch from hook. Join with sl st in back loop of first hdc. First Petal: 1st row: Ch 1. 2 sc in back loop of same sp as last sl st. Ch 1. Turn. 2nd row: Ch 1. 2 sc in each sc to end of row. 4 sc. Turn. 3rd to 5th rows: 1 sc in each sc to end of row. Ch 1. Turn. 6th row: (Draw up a loop in each of next 2 sc. Yoh and draw through 3 loops on hook – sc2tog made) twice. Turn. 7th row: Ch 3. Miss first sc. Sl st in next sc. Sl st in side of each of next 5 rows of petal. Sl st in last sc worked on 1st row and in back loop of next hdc. Do not turn. 1st row: Ch 1. 2 sc in back loop of same hdc as last sl st. Ch 1. Turn. 2nd to 7th rows: Work as given for 2nd to 7th rows of First Petal. At end of Sixth Petal, fasten off. Trumpet: Join B with sl st to any front loop of 1st rnd. 1st rnd: Ch 1. 2 sc in same sp as sl st. *2 sc in next front loop of sc. Rep from * around. Join with sl st in first sc. 2nd and 3rd rnds: Ch 1. 1 sc in same sp as sl st. 1 sc in each sc around. Join with sl st in first sc. Fasten off at end of 3rd rnd. With MC, ch 6. 1st row: 1 sc in 2nd ch from hook. 1 sc in each ch to end of ch. 5 sc. Turn. 2nd and 3rd rows: Ch 1. 1 sc in each sc to end of row. Turn. 4th row: Ch 1. 1 sc in each of first 2 sc. 3 sc in next sc. 1 sc in each sc to end of row. 7 sc. Turn. 5th and 6th rows: Ch 1. 1 sc in each sc to end of row. Turn. 7th row: Ch 1. 1 sc in each of first 3 sc. 3 sc in next sc. 1 sc in each sc to end of row. 9 sc. Turn. 8th and 9th rows: Ch 1. 1 sc in each sc to end of row. Turn. 10th row: Ch 1. 1 sc in each of first 4 sc. 3 sc in next sc. 1 sc in each sc to end of row. 11 sc. Turn. 11th to 14 rows: Ch 1. 1 sc in each sc to end of row. Turn. 15th row: Ch 1. Sc2tog over first 2 sts. 1 sc in each sc to last 2 sts. Sc2tog over last 2 sts. Turn. 16th to 18th rows: Ch 1. 1 sc in each sc to end of row. Turn. Rep 15th to 18th rows until 3 sts rem. Fasten off. Stem (make 6). Cut floral wire each 7 ins [18 cm] long. With MC, ch 27. 1st row: 1 sc in 2nd ch from hook. Align floral wire with chain made. Working over floral wire, 1 sc in each ch to end of ch. Fasten off. Daffodil bouquet: Glue Daffodil to folded end of stem. Holding 2 stems tog, Wrap leaf around stems. Wind MC around wrapped leaf at base of bouquet. Secure yarn.